Genuine Alsterfors Vase - Fake Signature? 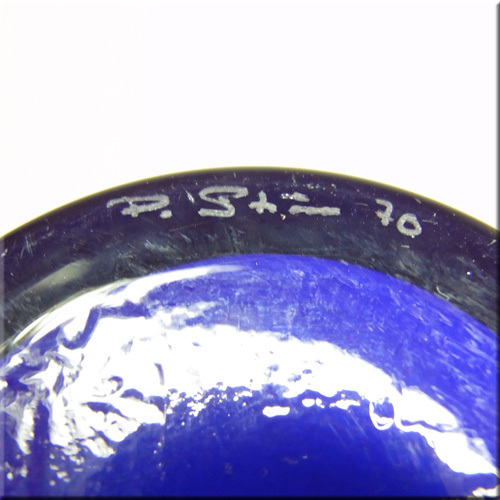 Topic: Genuine Alsterfors Vase - Fake Signature? I have this Alsterfors vase, signed on the base, but it has been suggested that the signature might be fake and added later, as it is different from most other signatures. Also it is dated '67, and I am told P. Strom began working at Alsterfors in 1968, is that correct? Also by the way, something I've wondered for a while, is it Per "Olaf" Strom or "Olof"? Both seem to be used quite a lot, on this board and elsewhere. Thanks! Re: Genuine Alsterfors Vase - Fake Signature? I have one in white with the same sig PO STRÃ–M 67 and I've owned it for 20 years or so. 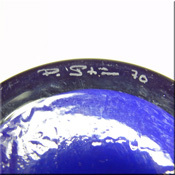 I also think there is no point in faking a signature of such an obscure maker - why should anyone want to? Olof is the Swedish form of the Norwegian Olav. Olavo is the Portuguese form, Ã“lafur in Icelandic, Ole in Danish and Aulay in Irish. I am sure these are all interchangeable, but being Swedish het would probably be Per Olov. That's interesting, I have seen a few of these signed and also plenty that were not. Often the signature is very faint and difficult to make out. My first reaction was that the signature was added later as it 'usually' (as in Wayne's last photo) looks like P . Strom rather than P O Strom (the O is so small it ends up as a . ). However, as Ivo has another signed in the same fashion then I too would expect them to be genuine signatures. I would not necessarily agree with a glassworks being too obscure for someone to try forging a signature, those who are dishonest often will try almost anything to make more money. Usually their knowledge is limited and it is not as if they care, all they want is profit. Today I saw a faked Mdina signature on a nice enough and genuine bit of Mdina at a bootsale, I would have bought it but it was just too damaged (a couple of nasty impact marks). but being Swedish het would probably be Per Olov. Why Olov? Is this a typing error? Did you mean "probably be Per Olof". As far as I know it's Per Olof StrÃ¶m. I've never seen anything else but Per Olof. Hi Inca, I'm assuming Ivo meant to write Olof at the end there. If you search this board for "Per Olaf", it gives roughly the same amount of results as a search for "Per Olof". Also Mark Hill mentions Per Olaf in one of his blogs. From what I can work out from a magazine article. He worked at Alsterfors from 1967 until 1971, when the glassworks went bankrupt. You have to remember that he was prolific designer in such an incredibly short period of time at Alsterfors, so I guess even by 1969 he just quickly signed his pieces. Oh, his name is Per-olof StrÃ¶m. Page created in 1.42 seconds with 28 queries.